Yay Bingo Casino will then reward you with a bonus (Welcome Bonus is for new players only). 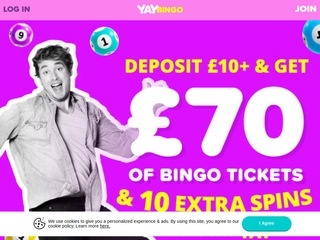 The terms and conditions of the bonuses vary between different casinos and might also change over time and between different countries, so it is important to compare the different offers and read the T&C for Yay Bingo Casino before signing up. Yay Bingo Casino is fresh from the oven online gambling site launched just in April 2018. It boasts well-designed interface and layout and a user-friendly navigation, which always come as a plus. Holding licenses by two of the strictest regulatory bodies that are the UK Gambling Commission (UKGC) and Gibraltar Gambling Commission, Yay Bingo Casino is a trustworthy and reliable place to gamble online. On top of ultimate safety and security while gambling here, and knowing that you are laying at a place that advocates responsible gambling, it is good to know that Yay Bingo Casino offers its complete portfolio on its mobile platform as well, and you do not even need to download an app to use it; simply access the website directly from your mobile browser. Yay Bingo Casino is compatible with Windows, iOS and Android alike, regardless of if you are on your smartphone or tablet. With its fun and vibrant color scheme of purple and bright yellow, Yay Bingo Casino is also an appealing site to pay a visit to. Powered by Dragonfish platform, Yay Bingo Casino offers an excellent game selection, if you are into Bingo and slots. Fans of the traditional game and modern spinning entertainment will have plenty to look forward to at this online casino. In terms of slot games, Yay Bingo Casino has well over 300 slots on offer. Those include the branded Love Island slot, Rainbow Riches and Irish Luck, as well as Slingo Riches and Slingo Extreme, Pegasus slot, Asteroids slot, which all nicely add up to the diversity. In addition to those, fan favorites like Starburst, Stampede, Twin Spin, Cash Stax and 99 Time slots are all on board. While Yay Bingo Casino truly excels with its slot offering, we would not mind a few table games. However, as it is still quite young, there is time to add more games to the lobby, so that might happen in the upcoming months. While at Yay Bingo Casino, why not try some of its Bingo games? The online gambling venue offers the traditional game in the 90-ball variety, as well as in 75 and 52 editions. The thematic and luxurious Bingo rooms include Street Party, Blighty 90, Wonky, Number 10, Last Call, Candylicious, Hit 52 and Fun in 90. Each of the rooms features an interactive chat facility, which caters for the social feel to your online gambling. We have not been able to find any live dealer games at Yay Bingo Casino, but we do not mind it at all. A Bingo specialist, Yay Bingo Casino has done its best to set the bar high for an online Bingo site and provided for its client’s hundreds of video slots to enjoy. Most players have been more than satisfied with the service, as the user experience at Yay Bingo Casino is cemented at 5 out of 5 stars for us. This Cassava Enterprises Gibraltar owned online gambling site deals with banking effortlessly. The site accepts an ample selection of payment options from ewallets to credit and debit cards and traditional bank wire transfers. Depending on the means of transferring money you go for, you will need to wait a particular amount of time. Typically, ewallets take only up to 24 – 48 hours to be fully processed, while requests made utilizing cards or bank transfers might take up to 5 working days. Ewallets for both depositing and withdrawing include Neteller, Skrill, PayPal, Paysafe Card and EntroPay, while the cards on offer are Visa and MasterCard. The minimal amount that you can withdraw is £5 for all methods except for bank wire transfers that require you to withdraw at least £10. What we truly appreciate about Yay Bingo Casino is that it sets absolutely no wagering requirements. At Yay Bingo Casino you can find the Help Room if you need assistance at any point. While Live Chat is currently not an option, and one minor flaw to perhaps work on, you can still get in touch with the customer support team’s efficient and friendly representatives. One way to do so is to send them an email to [email protected], or to simply fill out the online enquiry form available directly on the website. All you need to do is provide your basic information such as your name and email address, as well as your enquiry, and one of the agents will get back to you in no time. Replies to emails are typically estimated to arrive 24 hours upon submission at most. Another way to directly talk to the professional team’s member is by phone; ring the toll-free number for the UK 0808 238 9814. The phone service operates between 7 am and 2am, every day of the week.